Science is what scientists do, not what nonscientists think they do or ought to be doing. Wetenschap is wat wetenschappers doen. 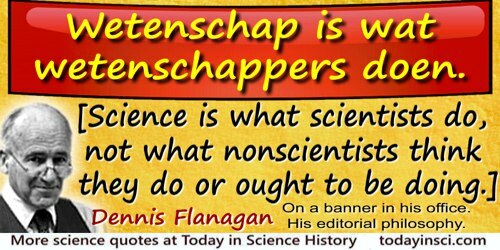 Flanagan's motto as magazine editor for selecting content to put in Scientific American. Because he heard, and liked the sound of this slogan in Dutch, he put that version on a banner in his office. As quoted in obituary by Marc Santora, 'Dennis Flanagan, 85, Editor of Scientific American, for 37 Years', New york Times (17 Jan 2005), B6.